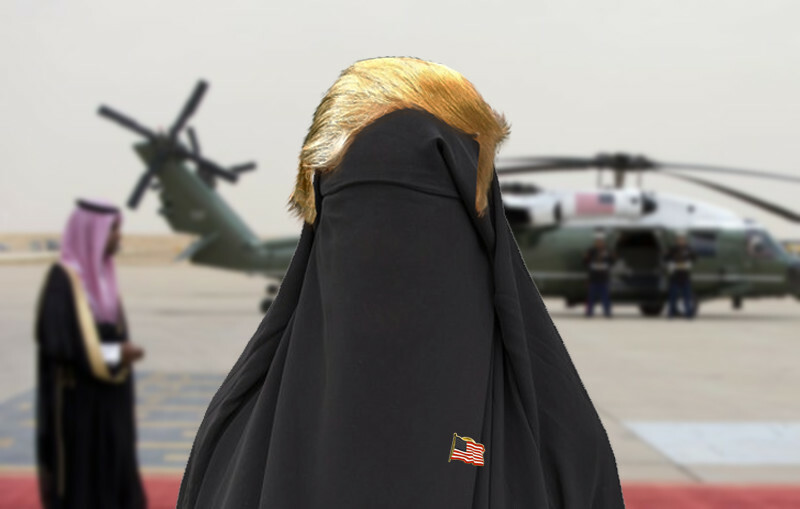 On Saturday, President Trump (who might be pictured above) landed in Riyadh, Saudi Arabia wearing a long, flowy burqa. Riyadh, Saudi Arabia – Kicking off a five country swing across the Middle East and Europe, President Donald Trump arrived in Saudi Arabia donning a burqa, an outer garment some Muslim women wear to cover themselves in public. According to his staff, Trump wanted to ensure his first international trip as President was a public relations success, and one that exhibited cultural sensitivity. A confused King Salman greeted the President with a lavish reception which included a red carpet and fighter jet flyover. According to an aide, Trump’s staff recommended other outfits for the visit, but said he refused. By Saturday afternoon, Trump had received marriage proposals by 25 love-struck Saudi men.